Contact Hardman Signs for the Dallas signs that you need to give your company a competitive edge. In business since 1987, we've created successful promotional materials and signs for Dallas, TX clients across a range of industries. Unlike other Dallas sign companies, we employ a full-time staff of trained designers, fabricators, project managers and installation technicians who will provide the start-to-finish, customizable service that you and your business require. Read on to learn more about our Dallas sign shop. Dallas Interior Signs: Need interior signs? No problem - call our sign company today. Dallas Outdoor Signs: Hardman Signs creates outdoor custom signs. Dallas Signage Types: Our signage roster is locally unparalleled - read on to learn more. Dallas Commercial Signs: We create commercial signs for businesses across Dallas, TX. Dallas Custom Sign Services: Hardman Signs is the Texas company to call for specialty services like logo creation and file transfer. Dallas Digital Signs: Do you need a digital sign for your Dallas business? Hardman will satisfy all your digital signage needs. Dallas Channel Letter Signs: Channel letter signs are high-quality, durable displays in which every letter is separately mounted and individually illuminated, created a highly-visible and professional look. Dallas Real Estate Signs: Hardman Signs is the premiere provider of Dallas real estate signs. Dallas Church Signs: Hardman Signs is the leading provider of church signs in Dallas, TX. 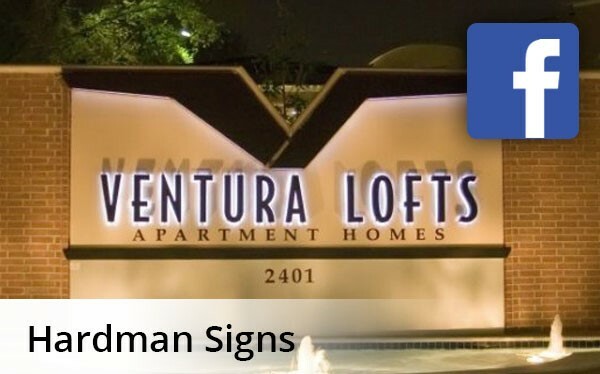 Dallas Apartment Signage: Whether you’re building a brand-new apartment complex or updating an aging property, there’s a simple way to attract potential residents and keep your current community informed—and that’s custom signage from Hardman Signs! Contact Hardman Signs to be matched with the Dallas signs that you need. We go the extra mile for our clients, providing the specialty services that other Dallas sign companies aren't equipped for. Get in touch with our Dallas sign shop today - fill out our no-obligation quote form to receive your FREE estimate or call today with your requirements.